After catching season 1 to 6, I HAD to, M-U-S-T watch this movie! It’s like the finale… and knowing Mr Big and Carrie tying the knot in this movie, lagi MUST watch! Ok, if you haven’t catch it yet, please don’t read on… if you have or have no intentions of catching it… by all means, read. I’ve always envied the relationship shared by the 4 of them. Their friendship is way amazing, they shared their differences, they fight and at the end of the day, they are still the best of friends. To be able to have 1 best friend is like searching a needle in the hay, let alone 4. Being a bag whore, I cannot help but WOOO… and WAHHH… and WOAH… each time I spotted a luxury bag. YSL Raspail Cascade Print, Gucci speedy, Prada clutch, LVs… label after label… gosh… happiness. HAHAHA… and when Carrie presents Louise with her very own Louis Vuitton Motard Firebird, I squeal in delight. And so I’ve read, the LV Vuitton Motard Firebird is sold out in Singapore! Sam was asking: “how do you know about these?” and I smiled and said: “I don’t know mama. You know… me, bags, fashion… I just know.” She knew what I was saying; I love reading magazines, knowing what’s in, the latest IT bag or IT colour. I don’t follow fashion strictly nor blindly but I love knowing it. – at the start of the show when Carrie was walking and there comes Charlotte, Miranda and Samantha, I was screaming with joy inside…I felt like I’ve known them for so long. – the BIG walk-in wardrobe BIG surprises Carrie with. Love is clearly an understatement. – where the girls all gathered to help Carrie pack. – though she was already asleep, Carrie still rushed over to Miranda’s place just in time to celebrate New Year with her and to let her know she ain’t alone. 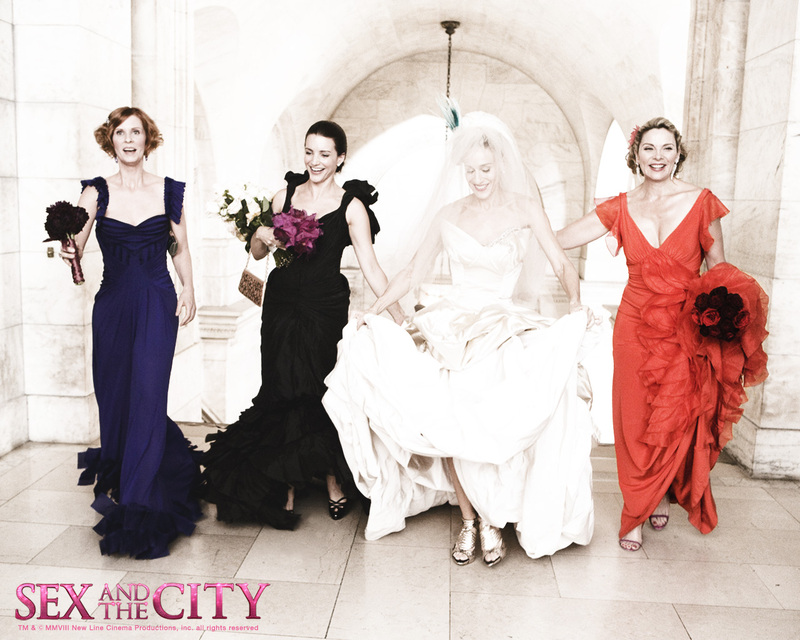 – the ending, with everyone there at the table in some normal café celebrating Carrie and Big’s wedding. What else do you need when you have the man of your dreams next to you along with all your besties…I wouldn’t trade that for anything in the world.